Physical therapy is needed by many people every day. Do you have problems with your health that pills don’t seem to be helping? It might not need urgent attention from a medical professional but that doesn’t mean it won’t in the near future. Physical therapy is a great way to not only reduce pain and increase mobility, but it is also the path to follow for those who want to stay strong and mobile for a long time. 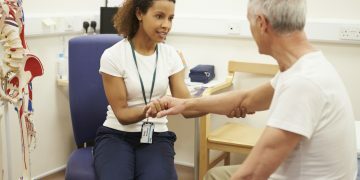 While there are so many reasons why considering physical therapy for your injuries and recovery processes after surgeries, we picked the top four reasons why physical therapy is important and why your doctor might recommend it. So, without further ado, here are four reasons not to ignore your bodies needs and why physical therapy is important. Sometimes we can be a little stubborn to accept the fact that we need help when it comes to pain or illnesses. We think that if we give some it time, it will disappear. Unfortunately, that is not the case most of the time and by ignoring the problem, you have created another one. Injuries can be an annoyance to have but without the proper care, they can extend and become much worse, sometimes to a point you will need surgery. If you get injured and heal with the help of a PT, properly, you won’t need surgery. Not only will physical therapy help you eliminate the risk factor from happening, it will also help prevent any similar injuries in the future. Joint pain is something most of us are familiar with. Reaching for something or moving a certain way definitely become harder and harder to tune out and at one point, it may turn into something else! To stop any of that from happening, your PT can fit you with therapeutic exercises, ultrasound, electrical simulations, and taping. Whatever is the most suitable for you, your PT will determine what the best way of treatment will be. Not only will the pain go away, with the help of your physical therapy, it won’t return. Are you having issues with bending over, standing up for a long time, getting dressed by yourself, moving while laying down or doing other physical activities that you have been doing for many years? Suddenly, your shoulders and back seem to hurt or your knees are weaker than before. It is normal. Unless you have been in physical therapy for a long time, we are all human and are bound to experience some unpleasantness with age. But, it doesn’t have to be that way. Stretching exercises are done with your PT, canes and crutches and other devices that will help your mobility can be provided and properly fit by your physical therapist to help you move freely and happily. Last but not least. If anything, the most important reason on the list for why you should consider physical therapy. The list of illnesses that can be managed with physical therapy is long. All the way from diabetes to breast cancer, physical therapy can help you manage them and ease the inconvenience of having to deal one more aspect of the problem. Below is a list of some of the illnesses physical therapy can help you with and how. Diabetes: helps to control blood sugar and sensation problems in feet. Arthritis: joint pain relief with exercises. Constipation: special exercises to help move the bowels. To Sum up, Physical therapy is highly recommended and even prescribed by doctors to help everyone feel better and less pain without having to pay heavy amounts of money for surgery or reoccurring doctors’ visits. Knowing that surgery is an expensive and a painful, recovery necessary, process, physical therapy might be the better option for you. What is occupational therapy and why your child may benefit from it?